How are EJCDC documents created? How should EJCDC documents be used? What user guidance is available? What are the principal advantages of using EJCDC standard documents? When and why was EJCDC founded? EJCDC documents are developed in subcommittees comprised of experienced engineers and attorney's advice. These subcommittees consider and review all conditions and contingencies that could take place in the completion of an engineer-designed and lead construction or infrastructure development project in the U.S. Once the committee has agreed on a contract, it is then presented to the full EJCDC Committee for approval. It is important to know the content of the document as these documents are tailored for specific projects. One should understand that a change in one may require change in one or more other documents. EJCDC recommends that a legal review be made, especially if any part of a document has been changed. EJCDC supporting organizations publish occasional white papers, and conduct regular seminars and other educational events. Some of the documents are guidance documents that can be tailored by user. Standard form documents include "Notes to User" to assist specifiers in preparation. EJCDC documents conform to recognized organizational format (CSI MasterFormat). They have been tested over decades of use and interpreted in courts of various jurisdictions. EJCDC documents reduce the potential for errors, omissions, redundancies, or conflicts in construction docs. All documents are fully coordinated and integrated. The documents provide for industry-accepted distribution of risk among project participants. Familiarity with these documents by both the Bidder/Contractor may result in improved prices bid to Owner. 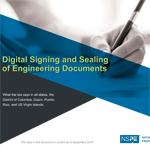 The documents are updated approximately every five years to reflect industry trends, court decisions, and changes in applicable laws and regulations. They are suitable for public works and private sector. Finally, EJCDC documents are less expensive than alternate standard documents and are created in user friendly MS Word format. In short, EJCDC documents are the most-thorough and best-organized standard documents available. What three organizations comprise EJCDC? And, in order to include other interested groups, EJCDC allows observers such as ABA; APWA; CMAA; CSI; NUCA; USDA/RUS; FIDIC; DBIA; AIA; WWEMA; American Congress of Surveying & Mapping; American Arbitration Association; CNA/Schinnerer (VOSCO); XL Insurance, and others. EJCDC has existed since 1975 to develop and update fair and objective standard documents that represent the latest and best thinking in contractual relations between all parties involved in engineering design and construction projects. Driven by increased professional liability exposure of engineers, including lack of privity and the absence of a contractual relationship not a bar to a third-party claims, such as injured worker claims and contractor economic loss claims, EJCDC came together to develop objective standard documents that represent both parties in engineer-designed construction projects in the United States. EJCDC documents are intended to be objective, clear, thorough and consistent with current practice and laws, as well as responsive to user needs.